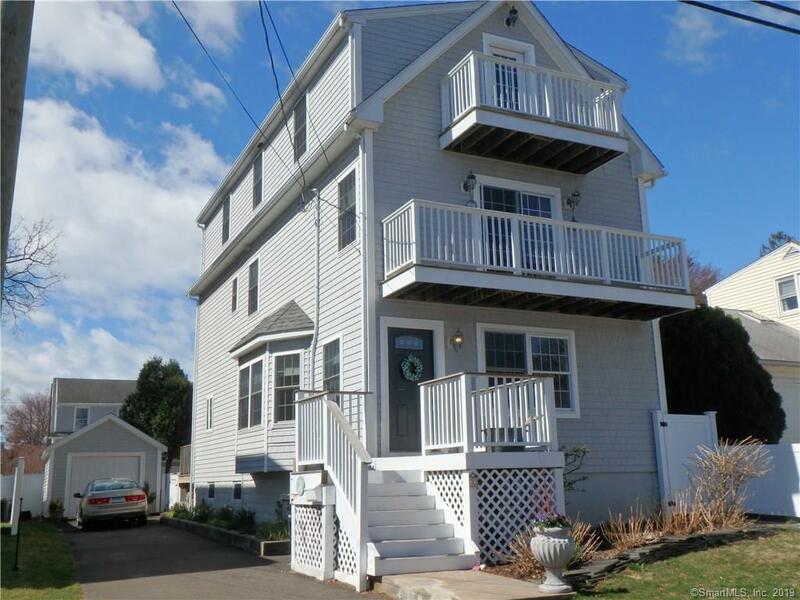 Beachy 4Br/ 3 1/2B Colonial just 6 houses from sandy shore! Fun, sun and gracious living are yours. Close to the beach but safe above flood zone. First impressions are "wow", with open floor plan for easy entertaining, hardwood floors throughout. The living area features a gas fireplace and the dining area focal point is a stupendous, sunny 12' bay window. Dining area is expanded by a 9' granite seating bar so guests can chat with the chef. The dream kitchen features thirty total feet of granite counter space, a 6' work island and pro appliances. Adjacent pantry area opens to rear deck for convenient backyard entertaining. The deck overlooks the fenced, private yard and detached garage. Upstairs the master suite has private water view balcony, walk-in closet, full bath with double sinks, jetted tub and stall shower. Second floor also features another large bedroom with full bath. Laundry conveniently located on this floor. Two large third floor bedrooms feature vaulted ceilings and share a 9'x13' Jack & Jill bath. The front bedroom has a balcony with views of Charles Island. The full unfinished basement has lots of storage room for beach toys and even a custom kayak locker! This home enjoys a great location on Wildemere Beach, between Milford Audubon Center and Walnut Beach's art galleries, ice cream shop, Lazy Lobster dining, kayak rentals and more. Sand Castle Contest and weekly concerts bring summer fun. Enjoy it all here this summer.